British RAF Typhoon fighter jets have been scrambled in response to two Russian Bear long-range bombers spotted off the coast of Cornwall, the Ministry of Defence (MoD) has said. The Russian bombers were in international airspace. 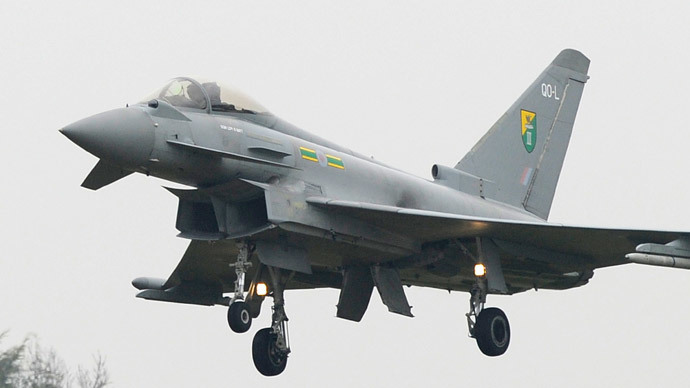 A spokesman from the MoD said: “RAF Quick Reaction Alert Typhoon fighter aircraft were launched yesterday after Russian aircraft were identified flying close to UK airspace. Thursday’s interception follows a similar event in January when two Russian Bear bombers flying close to UK airspace were intercepted by RAF Typhoons. The British fighter jets were scrambled from bases at Lossiemouth in Scotland and Coningsby in eastern England, according to the MoD. The UK Foreign Office summoned the Russian ambassador to lodge a complaint about the flight of Russian military jets over the English Channel, which authorities claimed posed a danger to passenger aircraft. However no details were given as to how the bombers posed a danger. Russia's Air Force spokesman said the air patrol flights were carried out according to an approved plan, and conducted in strict compliance with international regulations of the use of airspace above neutral waters, without violating other countries' borders. Earlier this week, a Russian frigate was escorted through the English Channel by the Royal Navy. A MoD spokesman said the British Royal Navy cooperated with French military forces in monitoring the vessel as it made its way through the Channel. Ria Novosti reported a statement by the Russian Western Military District, which indicated the ship would return to its base in the Baltic Sea by February 23.